The fraud and criminal nuisance-accused ex-minister has been in South Africa getting treatment for an undisclosed ailment over the past few weeks. He returned to Zimbabwe last Thursday after being issued with an arrest warrant for failing to turn up at a court hearing. Meanwhile, his lawyer Lovemore Madhuku also told court that Chombo has moved from his Mt Pleasant home to a new residence in Chishawasha Hills. “As part of his reporting conditions, the accused was ordered to stay at his Golden Stairs house in Mt Pleasant, but the accused wants to let the police know that he is now residing at a different address,” said Madhuku. Reasons for relocating were not given in court but when Chombo initially appeared in court, he revealed that the main gate to this house was bombed while some windows and walls were damaged in November 2017 by suspected soldiers. The attack occurred on the night former President Robert Mugabe was removed from power by a military coup. Chombo was one of the targeted “criminals surrounding Mugabe” arrested by the coup leaders. 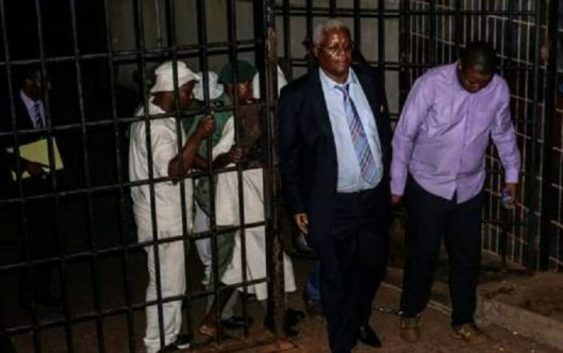 During Monday’s hearing, the former Zanu-PF politician was given a longer remand period to allow the High Court to decide on his application for stay of proceedings at the magistrate’s court. Prosecutor Tapiwa Kasema told court that ruling on the application was expected mid-March, adding that, as such, there was no need to clog the lower court with cases which will simply be coming for postponement. His co-accused in the criminal nuisance case were also remanded to March 15 awaiting the upper court determination on his application. The alleged accomplices are Kudzai Chipanga, Munyaradzi Hamandishe and Mathew Mleya. The case related to images in which they reportedly posed for photographs wearing Zanu-PF regalia.